Occupation: Manager of Oike Gallery in New York. Powers/Abilities: Trained assassin, deadly martial artist skilled with use of swords. History: Both her father and grandfather had been sohei, trained warriors who belonged to an ancient and secretive Japanese order dating back to the year 778 and the temple of Enryaku. But Ana Ishikawa's life should have followed a different path. Her father Shiro had given up the path of the warrior when he met Ana's mother Catherine, a Catholic missionary, at college. Unfortunately others weren't willing to let him retire so easily; the Yakuza sent an assassin, Masahiro Arashi, to kill Shiro. Attacked at home, Shiro proved more than capable of defending himself, and would have come out best in the encounter had not young Ana distracted him at the wrong time. When Ana's brother Toro came to his father's defence, he suffered the same fate. Ana grew up with the guilt of these deaths on her conscience, and although her mother was opposed to it, Ana's grandfather Yoshitora taught his surviving grandchild the ways of the sohei. By day she studied, eventually going to the Inagaki School of Art and Design in Kyoto, but by night she honed her combat skills. When Ana finally felt she was ready, she began the hunt, planning to avenge the deaths of her father and sibling. She dressed in red battle garb, and disguised her face with white paint, inspired by the legend of Yuri Ishikawa, who as Tora No Shi (the Tiger of Death in Japanese) had been the heart of a revolt in 1637 that had fought against the Emperor's repression of Japanese Christians. Ana's ferocity on the hunt, combined with her resemblance to her legendary predescessor, gained her the title Shi (Death), before her conscience and morality finally won the battle with her thirst fo vengeance. Having succeeded in getting Masahiro sent to prison, Ana renounced killing and tried to take up a normal life again, working as manager of the Oike Gallery in New York. Her sense of justice remains though, and she continues to don her other persona whenever she feels that innocents need her help. 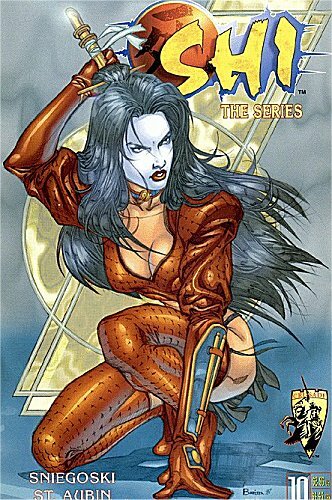 Comments: Shi was created by William Tucci, founder and owner of Crusade Comics. In 2008 Shi will be taking part in the War of the Independents.